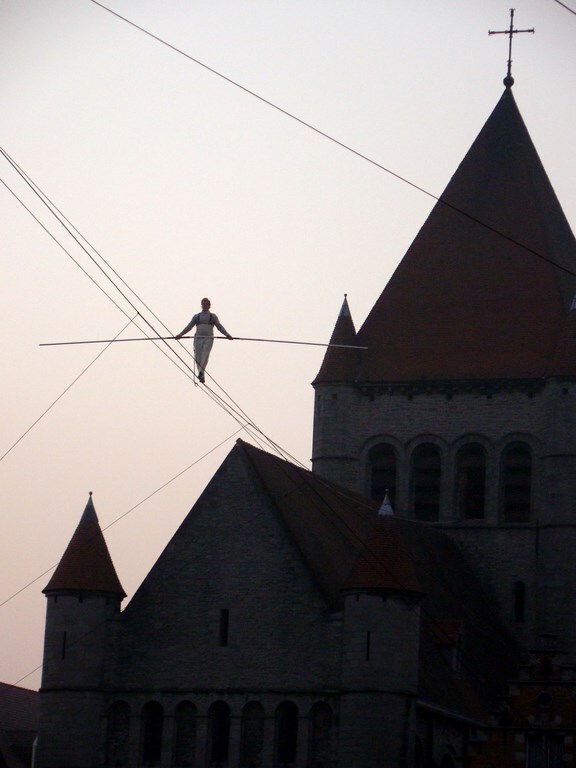 A highwire walk is a good possibility to pay tribute to a natural environment or cultural heritage and create a poetic and rare moment. 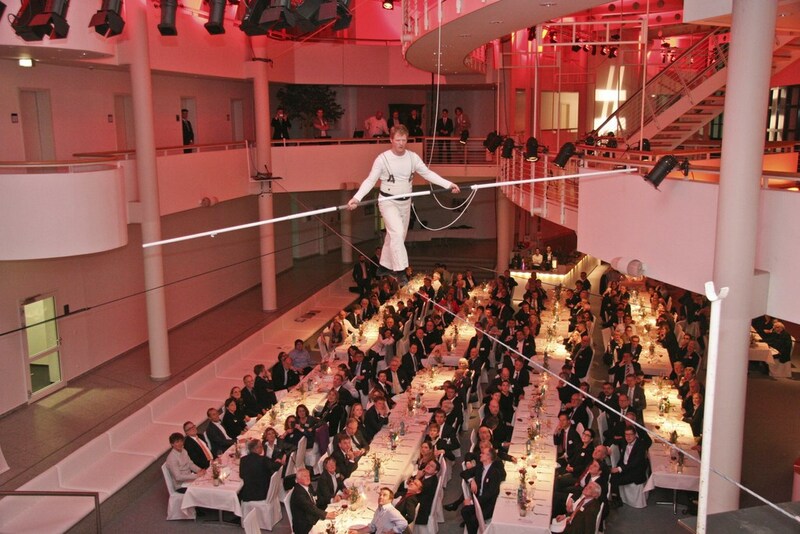 Inside or outside, inbetween pylons or buildings, horizotal or on an upgoing wire, a wire walk can be an event on its own or be integrated in a show, to an inauguration or a seminar. To contribute to this precious moment, in nature or urban environment, musical accompaniment is highly apprciated. My wish is to offer a spectacular and popular show, making the moment nice and poetic. My walk is based on artistic performance and not on dread (I walk with a saftyline), that your event will stay as a good memory with your clients. Dynamic, close to the public, a performance for all circumstances. An act of balance, force and lightness. Just as a show or as an interactiv play. Perfect for the smaller event, the medival show, your cocktail party or your conference. Every installation is tailored specifically to your conditions and needs. A technical visit is necessary to find out the optimal conditions for the performance, the time needed for the setting, and to get an approximation of the quote. Length I have wires from 10 to 330 meters in my stock ( but longer distances are possible). Height From 2 to 10 meters inbetween my Pylons and higher inbetween existing achorpoints (buildings, bridges, mountains etc.). Fully horizontal walks or ascentions on an oblique wire are possible. Duration From 10 to 45 minutes. According to your wishes and to the length of the wire. Ancrages Groundnails (depending on the ground), trees, rocks, columns, walls and weights. My long expierience and a well maintained and tested stock of material, allow me to have the best safety standards in all situations and to avoid any damage.